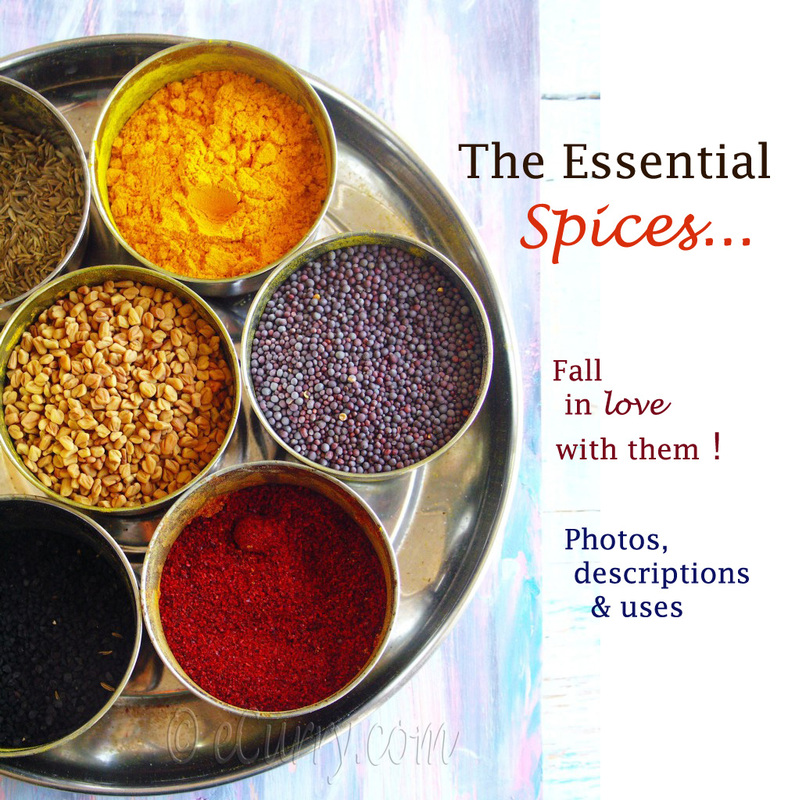 This recipe has variations in different regions of India. 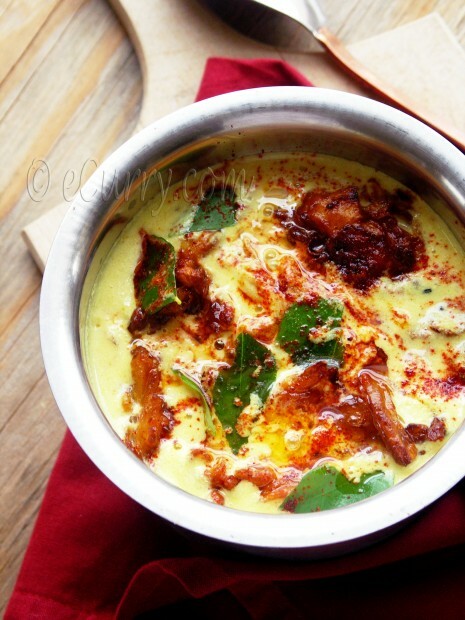 In the north, Kadhi is spicy and dense, usually with the dumplings than that it is in the western regions. This is another of those recipes which the hubby loves and I am not so fond of. I do get a lot of raised eyebrows from my Indian friends when I say I do not care much about Kadhi Pakori. 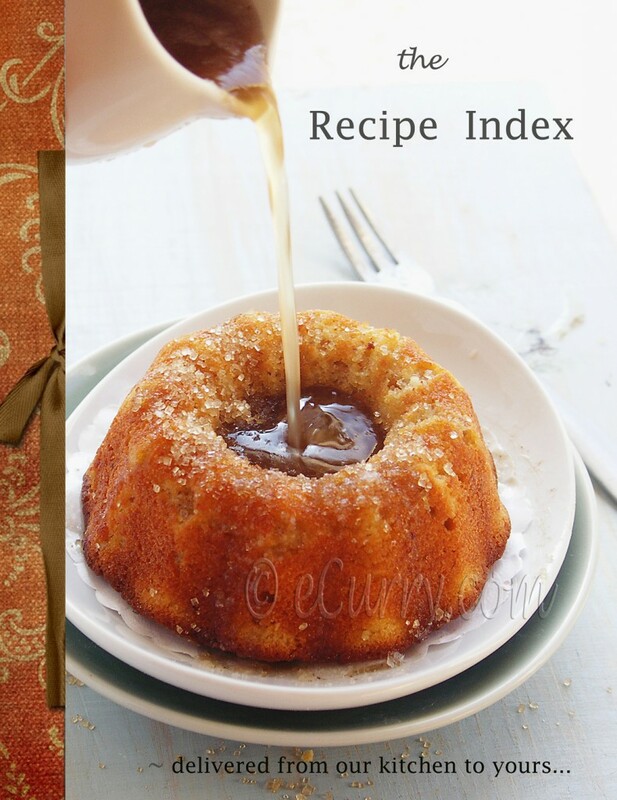 It is supposed to be well loved recipe. But then again, this dish is almost non existent in the eastern regions of India where I grew up. 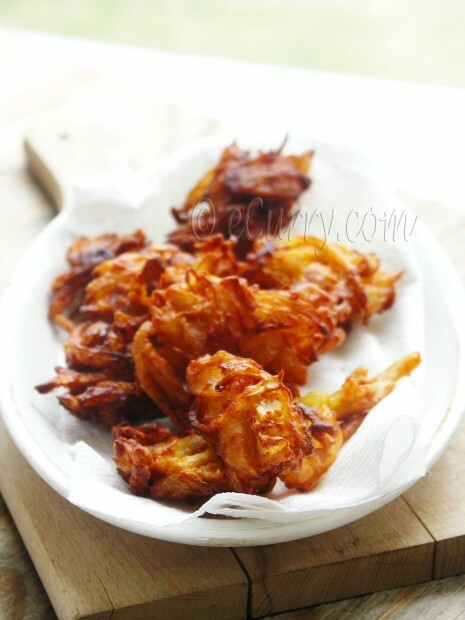 I do love the onion fritters and munch on them shamelessly while I am frying them. The fritters by themselves are well capable of enlivening a dreary day. Besides, by the popularity, they must taste good in the tempered yogurt sauce too. Let me mention here that this is a post from the archives. Few weeks back I posted the lighter version of the Kadhi. While I was browsing through my old posts, I realized this recipe deserved a little but more attention than it got. Its one of hubby’s favorite dish after all, and it is a pretty much well known dish in the Indian cuisine. The recipe below is the one with flavors from northern regions of India. 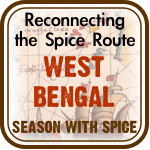 I cannot claim this to be an all authentic recipe, for the tempering and the spices vary from one home to another. Some recipes use potatoes to make the fritters or the dumpling, while others use onions and spices. 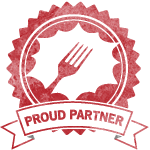 I have used the onion fritters here. Since I was not at all familiar with Kadhi of any kind, while growing up, I had to experiment quite to lot to have it perfected the way my family enjoys it. Peel and slice the onions vertically in to thin half moons. Mix salt and besan/chickpea flour with the sliced onions, add the garlic paste, chili pepper and ajwain/carom seeds and mix it with hands; squeeze the onions while you mix so the water from the onion comes out and makes a paste with the besan. It should a sticky gooey paste. If it is not, you will need to add little water. Set the paste aside. Heat enough oil in a pan or wok to deep fry. Spoon out the mix, one full tablespoon at a time in the hot oil and fry till they are golden brown. Drain on paper towels and aside. These are to be added to the Kadhi sauce, when almost ready to serve. In a big bowl mix yogurt, chickpea flour, garlic paste, sugar and turmeric and mix it well with a whisk, so there are no lumps or solid particles. Add about 2.5 cups of water (1.5 cups water if using buttermilk), and beat for some more time till it gets to a smooth soupy consistency with no lumps. (To make things easy, I combine everything in a blender and blend till smooth). Heat 1 tablespoon of oil and the cinnamon, and cloves. After a few seconds, add the dry chilis, asafoetida and mustard, cumin and fenugreek seeds and the slit green chili pepper. Once the seeds start to splutter add the chopped onions and ginger and fry till the onions start to brown. Add the whisked yogurt- flour/buttermilk mix to this and simmer at medium- high heat till it starts to foam up. Frequently stir during the yogurt mix in the pan during this time. It will take about 15 minutes for it to be done. After 10 minutes add the curry leaves, salt and the pakoras/onion fritters. Boil for another five minutes, and switch off the heat. Prepare the tarka only when ready to serve. 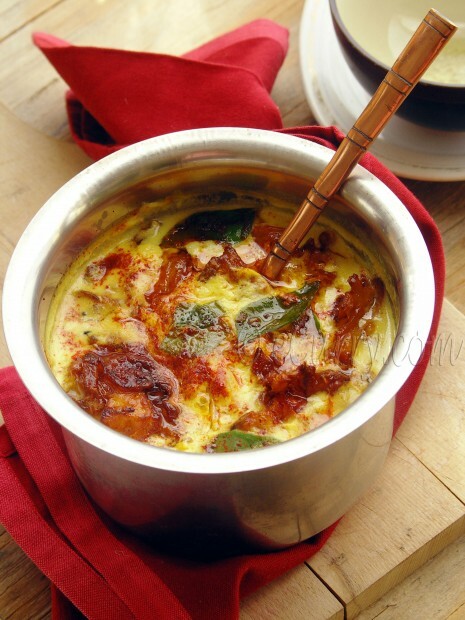 Transfer the cooked Kadhi Pakori in the serving bowl. 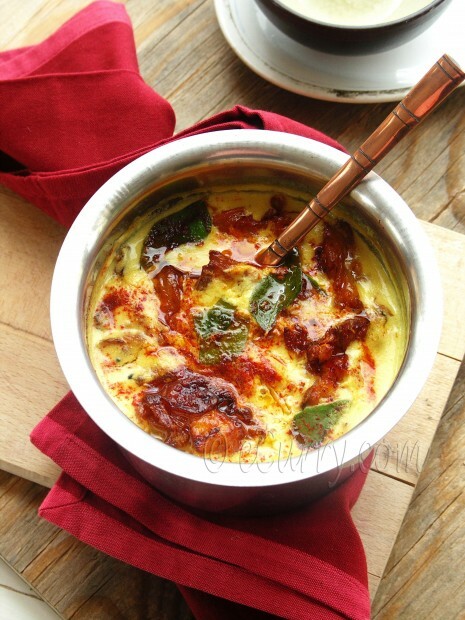 Sprinkle red chili powder and the fresh herbs (curry leaves or cilantro) on the prepared kadhi. Heat the tablespoon of oil/ghee in a small pan and immediately pour this immediately over the prepared Kadhi. Serve hot with plain rice or roti/flatbread. Dee of Ammalu’s Kitchen is hosting Susan’s MLLA #33. The Kadhi is on its way to the event. August 27th, 2008 | Category: Curries, Sides & etc. I had tasted curry on my first to India ! It is just yummy. Thanks eCurry for posting this recipie. Will surely try it. By the way, I shouldnt forget to tell you that yr recipes have excellent explaination of the steps. I just love the photos !!! yum yum yum. Why dont you upload some more Indian desserts? Looks very authentic esp in the stainless steel bowl.. Honestly I have never eaten this and have heard a lot about this..We make the simple version and I am very fond it but it is perhaps time for me to make it!! Onion fritters alone is something that I love having it. I used to buy it from the campus bakery. This is a new dish for me… Sauce alone looks very different from the usual ones…. Wow looks gorgeous..love pakodi kadhi.. pictures are sooooo good. The ladle looks so authentic. The Tadka on the top is so yumm and it makes me drool …. I cannot wait to make this for my son! He loves Indian food so much. this is one of my favorite dishes! love the spoon! This looks SO delicious and gorgeous! I could happily munch on the onion fritters alone. This looks fantastic! Though in my house I don’t think the onion fritters would survive long enough to make it into the yogurt sauce! That is one of my favorite Indian dishes and yours look amazing, Soma! I usually eat them at a local Indian restaurant with cilantro sauce……Delicious! Delicious recipe!! with all the spices and tasty onion fritters, super yum!! Now I’m craving some spicy food!! I just wanted to stop by and say ‘thank you’ for leaving such a nice comment on my blog. I’m glad I did this and discovered your blog. 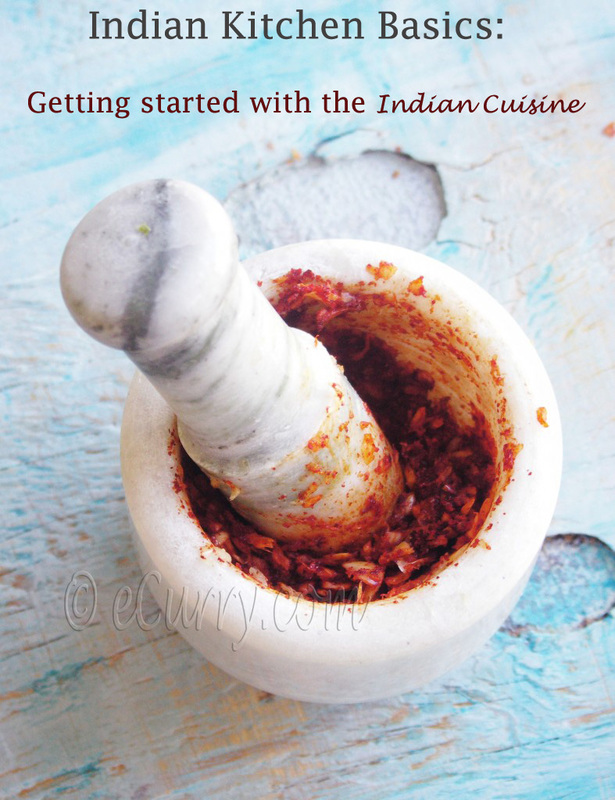 I’m a big fan of Indian cuisine and I’m always looking to learn more about it. Your wonderful blog will be a great inspiration for me. You are making me drool. I never tried pakora in a yogurt sauce like that. Incredible dish, love it and can’t wait to try this! Love your website! Great Post!! One of my fav…. Nicely photographed! 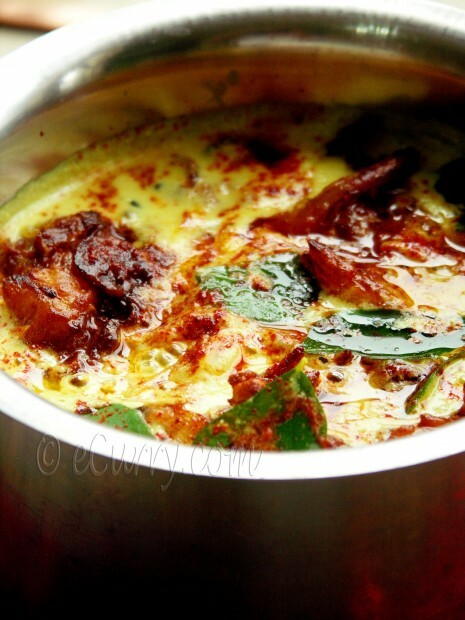 Kadhi is one of my all time favorites and this one looks especially good!!! We dont make kadhis in hyderabad, so this is new to me… But it looks absolutely delicious. I should try this out sometime.